England ran New Zealand close and yet again they came up short, but now more than ever since Stuart Lancaster took over I can see them as World Champions next year. Saturday was my first chance to see the latest upgrades to the stadium as part of a £75m programme of improvements leading up to the Rugby World Cup. The hospitality areas have been given a makeover and white cladding has been put on the outside of the structure to brighten up the bland concrete fascias. 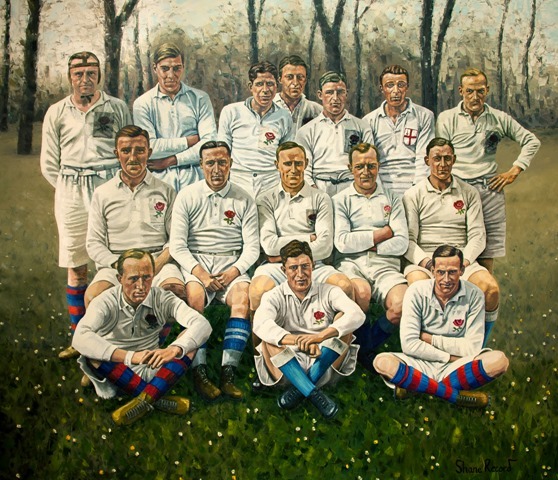 As part of the centenary commemorations of The Great War a new painting, “England Forever”, has been commissioned to hang at the top of the staircase in The Spirit of Rugby depicting the last England team to play before war broke out. Six of the players were killed during the war, their deaths symbolised by darkened roses on their chests. Out in the bowl all the seats have been replaced and there are two huge new screens, but the most striking improvement is to the match lighting. They have used LED floodlights that give out a mind-boggling 2500 lux, which you have to compare to standard club floodlights which are between 100 and 300 lux. The effect is stunning with no shadow and the playing area brighter than day. The difference was particularly marked if you watched the game on TV. When Kyle Eastmond passed to Mike Brown who had the line at his mercy it looked like England would go two tries ahead, and although he would catch the ball and ground it over the line 99 times out of 100, this was the 100th which was dropped. If England had the rub of the green and these incidents had gone their way, instead of turning round at half time 14-11 up, they conceivably could have been leading 21-3. 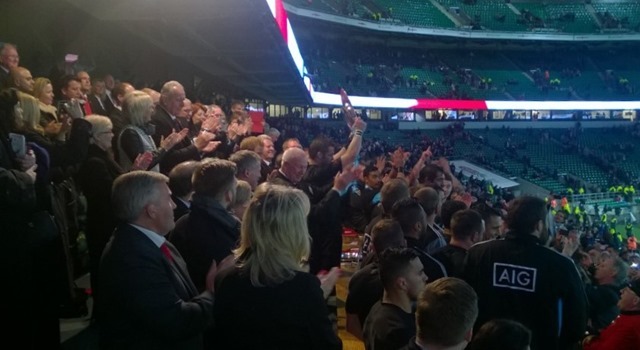 In the second half the All Blacks gave a masterclass in how to control and manage a game in very difficult conditions, but I don’t think they could have overcome an 18 point deficit with England so dominant in the line-out and scrum. I have further reason for optimism in the World Cup when I look at the players who weren’t present; Corbisiero, Coles, Launchbury, Tuilagi, Burrell, all of who potentially could have made the match day squad. There was room for improvement in England’s game and some of these players could have been the difference between defeat and victory. The All Blacks are the best team in world rugby, but yesterday they looked beatable and in a year’s time there is every chance that England will do exactly that in the Rugby World Cup final….but they will need a bit of luck! I question key decisions in coaching management and game strategy. If farrell wasn’t doing the job why would you push him to 12 THEN 13 other than nepotism. A change at scrum half saw Youngs throw wayward passes in attack and defence at key moments. With a couple of minutes remaining we go for a time sapping scrum with the outside chance of a PT. Luckily we get PT but time had run out. AB’s were calm and stoic in attack. We panicked. Top two inches count when fatigue sets in. This, we need to sort before we can think of RWC finals. Only three straight wins now will do.